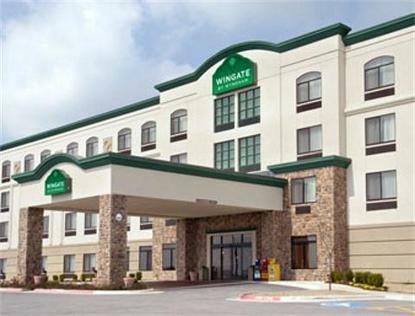 Located within One Mile of Northwest Arkansas Regional Airport, XNA, makes the Wingate by Wyndham Bentonville the only Airport Hotel in Northwest Arkansas. The hotel is conveniently located near the corporate headquarters of WalMart, Sams Club and Tyson Foods. Nearby attractions include the John Q. Hammons Rogers Convention Center, Arkansas World Trade Center, Museum of American Art and The University of Arkansas Campus. The hotel offers a complimentary 24 hour airport shuttle to and from Northwest Arkansas Regional Airport.We are built for business and so much more! Designed in a timeless, attractive, classic and distinctive prototypical design. At Wingate by Wyndham, we know you mean business. Our hotel is proud to offer a host of valuable amenities at no extra cost to you. Our all-inclusive pricing model gives you access to services and benefits you will not find at other hotel chains, all FREE of charge.Business travelers will enjoy and appreciate increased productivity, by virtue of standard Wingate by Wyndham amenities. All offered in on all-inclusive mid-level price and backed by the Wingate by Wyndham 100% Satisfaction Guarantee. We are high tech and consistent! Plus, every Wingate by Wyndham is built to stringent specifications, which means that all Wingate by Wyndham hotels offer all Wingate by Wyndham guests virtually the same experience. Every time!